Until the 1990s, “Colombian workers were among the most organized in Latin America, and Colombian trade unions were among the strongest.” But in 1990, under pressure from the United States, the International Monetary Fund and the World Bank, Colombia began to implement structural adjustment policies. These “drastic austerity measures” included “cuts in rural social investment and farm subsidies, layoffs or salary cuts for public sector workers, and the relaxation of rules covering foreign investment.” This greatly increased the power of business and decreased the power of workers. At one plant in the capital of Bogotá, the General Motors-Colombia (G.M.-Colmotores) assembly plant, this led to a decline in union membership from a peak of over 1,400 to just 45 today. Worker protections have predictably declined with the decline of union strength and Colombia is today the most dangerous place in the world for union organizers. More labor activists are killed in Colombia each year than in all other countries combined. Whereas in the past, Colombian workers injured on the job received benefits analogous to workers’ compensation in the United States, now they can very often be fired without either severance pay or employer liability for the health concerns. G.M.-Colmotores has fired dozens of employees injured on the job over the past decade. One such worker was mechanical welder Jorge Parra. He was fired in November, 2010 while recovering from surgeries related to his work injuries, won reinstatement, and was fired again July 2011 for organizing other injured workers into an organization called ASOTRECOL (Association of Injured Workers and Ex-Workers of General Motors Colmotores) in order to protect their rights. Parra, 37, walks with a cane from spinal injuries, has knee problems and difficultly typing from carpal tunnel. In August 2011, he and several others began a still-ongoing protest encampment in front of the U.S. embassy in Bogotá (503 consecutive days as of Sunday, 16 December). In addition to being a high-profile protest target representative of U.S. corporate power, the Colombia-U.S. Free Trade Agreement, and a party capable of effectively pressuring G.M., the space around the U.S. embassy is also so heavily securitized that it’s paradoxically one of the few places in Colombia where labor organizers are relatively safe. Not that most of the protestors had many options. Several ASOTRECOL members and their were homeless after losing their homes. Due to their firings and inability to work, the workers couldn’t keep up with their house payments and other debts and were evicted. After exactly one year of consecutive protest in front of the U.S. embassy, ASOTRECOL members declared a hunger strike and several sewed shut their lips. Parra notes that this hunger strike was partially redundant given how they could not provide for themselves or their families anyway. G.M.-Colmotores felt the pressure from their drastic actions almost immediately and agreed to mediation. But G.M.’s final offers in mediation organized through the U.S. Federal Mediation and Conciliation Service would not have covered the first of several surgeries needed by Parra and the other injured workers, especially those needing spinal surgery, much less the enable the workers to provide for themselves and their families going forward (G.M.’s initial offer was $5,000 for all the workers to split.). ASOTRECOL members and supporting organizations then raised funds to send Parra to the U.S. to seek direct negotiations with G.M. 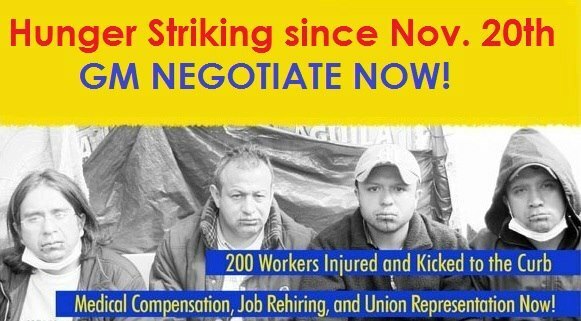 to continue agitating for ASOTRECOL’s demands: health care to cover work-related injuries, back pay to when they were fired, and reintegration into the G.M. workforce in jobs they’re physically able to do. His actions show how ASOTRECOL’s anti-imperialist framework is relevant to how they’re organizing for better shop conditions at a single factory in Bogotá. In the interview below Parra elaborates on solidarity and joint struggle and why it was important for him as a Colombian worker to stand with Palestinians. Jimmy Johnson (JJ): Why is it important for U.S. and Colombian workers to struggle in solidarity? And why is it important they support Palestinian liberation? And vice versa? Jorge Parra (JP): Well, first this is another manifestation of struggle. It’s a critical situation and one similar to what’s been done to our country [Colombia]. The extreme violence, where there are also assassinations and persecution. Really we’re compañeros in very trying situations and do what we can to back each other and work together and I’ll always be this way because I see the reflections between their country and my country. And further, we cannot only be in solidarity during our disasters, but in struggle and prosperity, and obviously, in sacrifice, in putting in the work. JJ: Solidarity actions often turn out to be quite symbolic like protest actions thousands of miles away from the site of a particular injustice. Are these actions important, what do they mean to your fight in Colombia, and what do you hope your efforts at the Detroit actions might mean in Palestine? JP: For those of us in such trying circumstances it definitely gives us an emotional lift to get this support. We’ve gotten support from many people in Detroit, in Portland [OR] and throughout the United States. We’ve also gotten support from South Korea, Brazil, Ecuador, Venezuela [all countries with GM assembly plants], from many part of the world. When hear this messages of support lifts our spirits to know we’re not alone in the fight. Really, in the hard situation ASOTRECOL is in, all I can offer to our Palestinian compañeras and compañeros is our respect, our voices in solidarity and to go to the actions. JJ: What is solidarity to you? 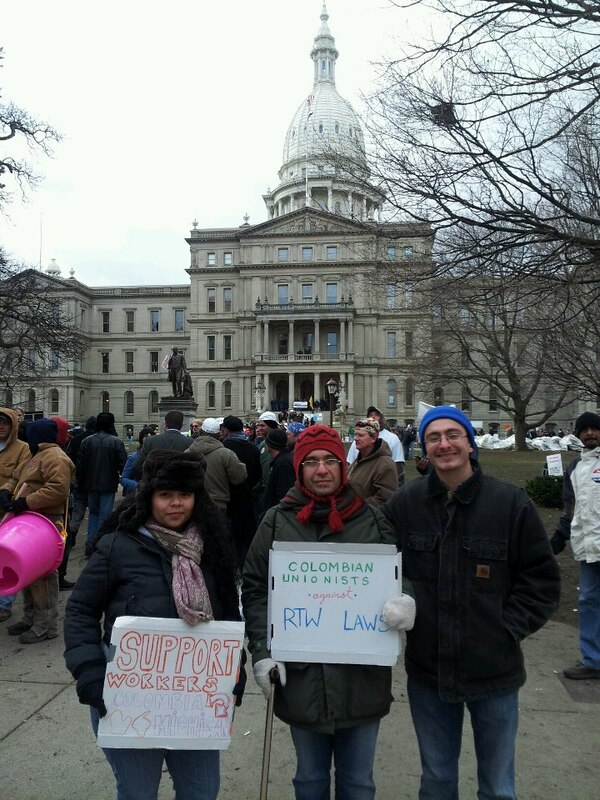 Jorge Parra joins rally in opposition to “Right to Work” legislation in Lansing, MI. JP: Solidarity is not just money and emotional support. It’s important to know that you’re not alone in the struggle and solidarity is us fighting for our rights on the same team, against these injustices, looking for some definitive change. So this is it, how we live it, supporting with marches, always standing at your side, getting your back. And well, also our situation is complicated as we follow our commitment to the struggle, to the revolution, to winning respect for our rights. JJ: What is your call for solidarity from Palestinian compañeros? JP: Just the same as we do. Walk with us, raise the visibility of our situation and contribute ideas, as we fight for a solution. These ideas are welcome. Also welcome are the subaltern voices of solidarity that accompany us in our struggle spiritually. Really all we can achieve in raising the profile of our situation in your networks, on the net, whatever is practical to do. This is what we hope for, that solidarity will spread our struggle. JJ: You made a specific solidarity statement with Palestinian prisoners who are also on a hunger strike. Although the struggles are not identical, you’ve arrived at a similar tactic. 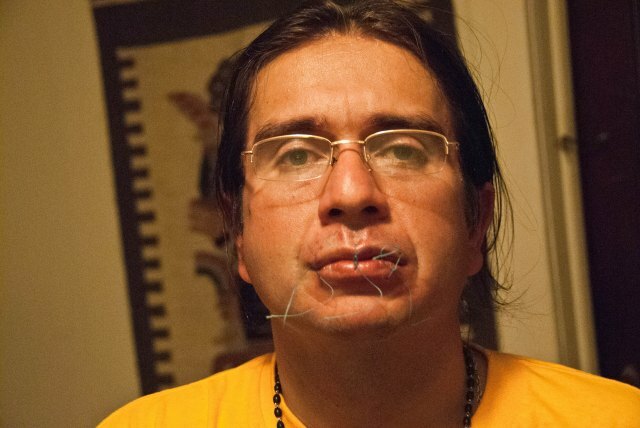 How did ASOTRECOL come to the decision to sew shut your lips and go on a hunger strike? JP: Really, through the same desperate situation. To see our families in such critical conditions, we made the decision to initiate the strike. It was a difficult decision because of the concentration of sacrifice and well, we’ve now carried the strike twenty-seven days and we’re hoping it doesn’t go to the maximum. But we’re also prepared to carry this to the ultimate consequences if needed to defend our position. We didn’t take this decision lightly but we’re desperately looking to resolve our situation and well, it warrants extreme actions. JJ: You fight for rights and do so as a spiritual man, mentioning several times during your stay that while your fight is on earth, your strength comes from god. What role is there for solidarity inside spirituality? JP: Well certainly the spiritual life is very important. I believe in god and that a just solution will come thanks to him. And god shapes the way we fight too. His message tells that if we want our struggle to succeed, we should be ready to make sacrifices for it. We all believe in a god and we know that we move forward thanks to his help. It is very important for us over everything else. To receive the spiritual support of people is absolutely the most welcome. Yes if you support us, remembering us in your prayers would be incredibly important for us and we’d be eternally grateful as we remember you in ours. JJ: What other thoughts do you have on solidarity, on struggle, on resistance? JP: First for our Palestinian compañeros, our solidarity and respect for your struggle. We walk with you, deeply, in search for your rights. We know the situation, like ours, is rather complicated. We both need the support of each of societies in their entirety. And too their indignation. The people have to be free of course; necessarily we have to birth a revolution. And a big part of any success is solidarity, counting the support of everyone.